Last Wednesday, we walked to the train station in The Hague (Friso cast his ballot right on the platform!) and hopped the train to London. One stopover in Brussels and a few hours later, we stepped out at St. Pancras. Picadilly line to District line and I was walking into the London Book Fair. I arrived late in the afternoon, just in time to catch a few panels before the wine came out. When I started working at a bookstore in Charleston years ago, my co-worker said “Have you ever seen book people drink? They’re a bunch of winos.” It’s true. Afterwards, the emerging translators among us headed to The Blackbird at Earl’s Court for a pint. Paper book sales are UP! According to The Guardian, physical book sales are up by 7% and ebooks are down. As a paper fiend myself, I can’t say I mind – the thought of reading a book on a screen has always given me an empty feeling. So what does the trend mean for translated literature? There are some who say that ebooks have kindled hope (excuse the pun!) for literature in translation by making more titles available to more readers. But the digital medium alone has yet to really change reader’s habits or tastes. Sure, you’ve got your avid mystery-reading aunt who swears by her Nook, but I think it’s pretty safe to say that most people have enough chargeable devices in their lives. Are those who are interested in say a beautiful short novel about an Iranian refugee in France or Goldstein’s latest Ferrante translation really going to give up the dog-eared page? One publisher I talked to mentioned that most publishers she knows simply put out an ebook as a matter of course, but when it comes to sales, it’s still all about print. Is translating children’s books a pipe dream? Like I said, I didn’t attend all of the panels, but wow – there sure were a lot of eager translators at Thursday’s talk on “What’s the problem with translated children’s books?” From the get-go, the panelists chose to avoid the title question, preferring to stick to a more positive note. But the so-called “problem”, or the real elephant in the room I would say, is that there just aren’t enough children’s books in translation to go around. Hopefully that will change in the future, but for the moment, most parents and teachers are happy if kids are reading at all. Emphasizing translated children’s literature may not be their first priority. In a panel on translating writers at risk, translators discussed their collaborations with dissident authors from countries like Saudi Arabia, Egypt, India and China. While it is not surprising that these governments dissapprove of their work, their persecution often becomes more severe upon being translated. Several of the panelists refused to even mention their writers by name for fear of generating unwelcome media attention. There really weren’t so many people in the audience, but that didn’t take away from the fact that the camera was rolling and a very official-looking London Book Fair plaque hung over their heads. 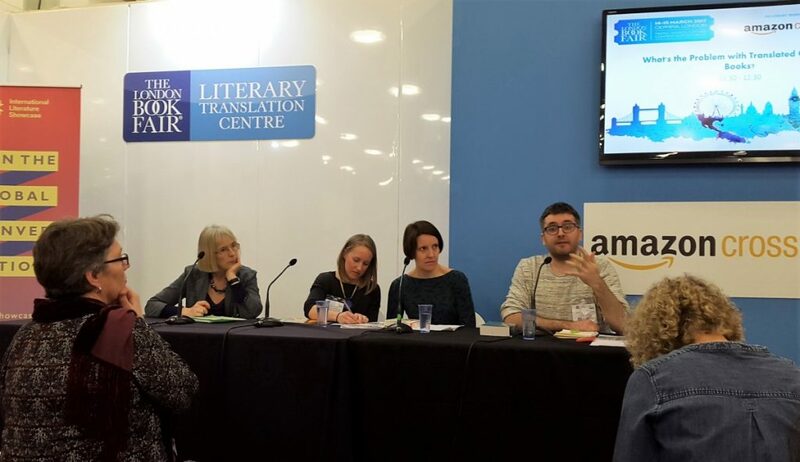 How easy it is for me to sit in the Literary Translation Centre at the LBF and casually listen to stories of writers’ personal ruin and think “How interesting, I should buy that book!” But the fact that I’m even interested in their work at all puts them more at risk. Can reading translated literature be a positive political act? Sure, it raises our awareness of international issues and gives us (by us I mean the mostly Western, university-educated book fair audience members) a good feeling, but do we inadvertantly play a role in the persecution of these writers? Is our readership part of the problem or part of the solution? Something to think about. Nearly every conversation I had quickly turned to politics. Arriving on the day of the Dutch elections, I was bombarded with questions (mostly Wilders-related) and was struck by how most Brits I chatted with seemed convinced that the Netherlands would be the next domino to fall – but hey, I guess misery loves company. By Thursday morning, I was happy for once to report that the Netherlands had decided to “normaal. doen.” But with the British Parliament busy Brexiting a few miles away and the circus on the other side of the Atlantic, it’s not surprising that politics was the only thriller people seemed to be about. Last year, gritty reality memoirs were hot. So fascinated were we of our own downward spiral that we were still keen to rub salt in the wounds. Political dramas, stories of refugees, corruption, drug addiction, dysfunctional families and train-wreck celebrities were apparently all the rage. But a year later, it seems we’ve had enough. In many of my conversations with industry experts, the same word kept popping up: escapism. I didn’t realize it was a thing, but I’ve been working on a short translation of W.F. Herman’s Het behouden huis (1952) for a workshop this week and it turns out it’s nothing new. We suffer, we wallow, we run. Which brings us back to the ole’ does art immitate life or life immitate art question. Academic and trade publishers need creative translators too! The holy grail of literary translation for most young translators I talked to still seems to be translating “great literature.” Most of us got into literary translation in the first place out of a love for languages and literature (in its highest forms, of course). Not surprisingly, most of us are what you might call book snobs (I mean how does a conversation move seemlessly from Mallarmé to the Oxford comma to the lack of feminist sci-fi without just a tiny bit of snobbery?). That said, I’ve noticed that there is a real need for creative translators among academic and trade publishers. From what I can tell, there is not a lot of crossover between the literary and commercial sides of the fair, but academic and trade publishers are great outlets for literary translators to explore. What’s the best book in translation you’ve read this year? This is my favorite question to ask fellow translators and editors. There are just so many wonderful titles and everyone seems to have picked up on something different! Of course, there’s a lot of pessimism out there for literature in English translation (…it doesn’t sell, translation is too expensive, yada yada...), but the more I talk to people who know, the more hopeful I am. Many readers still have Ferrante-fever (and who can blame them? ), but a lot of other intriguing titles came up again and again (Tram 83, The Story of My Teeth, The General Theory of Oblivion...) As for me, the prize goes to The Gringo Champion by Aura Xilonen trans. by Andrea Rosenberg. But I’m a real sucker for weird story lines and word play. All in all, it was a fantastic few days and a wonderful opportunity to catch up with old acquaintances and make a few new friends. Many thanks to the sponsors of the Literary Translation Centre and other sponsors for giving translators a corner in Olympia to call their own.